Linux desktop is on a roll. First came the revamped KDE 4.0 which took the level of User Interface(UI) fit and finish of Linux desktops to another level. Then came the GNOME Shell and Ubuntu Unity desktop interfaces. 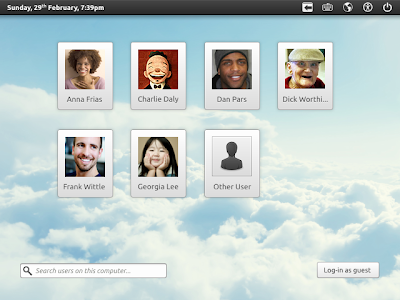 But one thing they all lack, especially GNOME Shell and Unity, are good looking and user friendly login screens. And here are some very interesting login screen mockups for GNOME. Back in the days of GDM 1.x, login screens were customizable and there were literally hundreds of stunning user made GDM login screens available for free download. You just had to pick your favorite. All that changed once GDM 2.0 replaced its previous, supposedly outdated, GDM 1.x based login screens. They are not customizable anymore. Andrew in his blog recommends to replace GDM with LightDM in Ubuntu. He has even made these interesting mockups on how login screens of future Linux desktops should look like. It is said that, LightDM is far more flexible and you will be able to create any type of ‘greeter’ you want with it. Watch the following Login screen mockup videos made by Andrew. One thing is sure, login screens in its current form is not good enough for Ubuntu Unity or GNOME Shell. Just like the desktop environments, GDM based login screens need a complete overhaul and these login screen mockups are pointers to what can be achieved. You might also want to browse through our collection of really interesting Ubuntu Unity UI mockups.